The South African Navy (SAN) is the naval warfare branch of the South African National Defence Force. The role of the navy is to prepare for and to conduct naval operations in defence of the RSA, its citizens and interests and to carry out peacetime operations in support of other national objectives. Other tasks include the maintenance, preservation and the provision of naval services in support of other state departments and authorities, including search and rescue, protection of maritime resources, and diplomatic sea transport support. The South African Navy can trace its official origins back to the SA Naval Service, which was established on 15 November 1921. Unofficially, however, the SAN can trace its history even further back, to the Natal Naval Volunteers (NNV), which was formed in Durban on 30 April 1885 as well as to the Cape Naval Volunteers (CNV), which was formed in Cape Town in 1905. On 1 July 1913 these two units were amalgamated to form the South African Division of the Royal Naval Volunteer Reserve (RNVR). 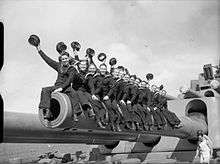 During World War I a total of 164 members of the RNVR (SA) served in the Royal Navy and a total of 412 South Africans served in the RNVR (SA) during the war, while the naval base at Simons Town played a strategic role to the Allies. The first ships acquired (on permanent loan from the Royal Navy) by the newly formed navy were HMSAS Protea (a hydrographic survey vessel), HMSAS Sonneblom and HMSAS Immortelle (both minesweeping trawlers). 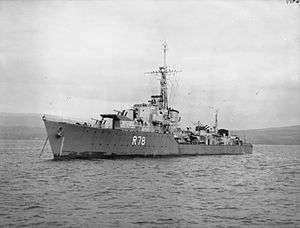 However the Great Depression meant the government had to cut back and the ships acquired by the Navy were handed back to the Royal Navy (HMSAS Protea in 1933 and the remaining ships in 1934). When World War II broke out the South African Naval Service was virtually non-existent, with only three officers and three ratings. In January 1940 a new naval unit, called the Seaward Defence Force, was formed. :338 Rear-Admiral Guy Hallifax CMG, who had retired in South Africa from the Royal Navy, was appointed Director of the Seaward Defence Force. This unit was to be responsible for operating the minesweepers, anti-submarine ships, and the other inspection and signalling duties in South African waters. From 1941 a number of SDF antisubmarine trawlers served in the Mediterranean. The Seaward Defence Force and the South African RNVR were consolidated on 1 August 1942 to form the South African Naval Forces (SANF). 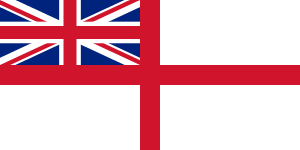 Due to the strong Royal Navy influence on its origins, South African naval forces used Royal Navy ranks. On 1 May 1946 the SANF was reconstituted as part of the Union Defence Force. It was renamed 'South African Navy' on 1 July 1951. The title of HMSAS (His Majesty's South African Ship) was changed to SAS (South African Ship) in 1952, and the Crown in the SAN cap badge was replaced with the Lion of Nassau from the crest of the country's coat of arms in 1959, two years before South Africa became a republic. In 1947, the SANF acquired three additional ships: the Algerine-class minesweepers HMSAS Rosamund (later renamed HMSAS Bloemfontein), HMSAS Pelorus (later renamed HMSAS Pietermaritzburg), and the Flower-class corvette HMSAS Rockrose (later converted into a hydrographic survey ship and renamed HMSAS Protea). The SAN's first destroyer, SAS Jan van Riebeeck (the former British W-class destroyer HMS Wessex) was transferred to South Africa on 29 March 1950. The SAN's second destroyer, SAS Simon van der Stel (the former HMS Whelp, and a sister-ship of the Jan van Riebeeck), was handed over to the Navy on 23 February 1953. Meanwhile, negotiations were taking place between the British and South African governments on the future of the Royal Navy's base at Simon's Town. The outcome of these talks was that the base was transferred to the Union on 2 April 1957 under the terms of the Simonstown Agreement, and that the Navy would purchase four additional frigates, ten coastal minesweepers and five seaward defence boats from Britain. In 1963 the first of the Type-12 President-class frigates were delivered and in 1970 the Navy received the first of its three Daphné-class submarines from France, the first of which being named SAS Maria van Riebeeck, after Jan van Riebeeck's Walloon wife. Political unrest in Soweto and elsewhere prompted the apartheid government to take even sterner measures in an attempt to keep the opposition under control which in turn led to a mandatory arms embargo against South Africa in 1977. As a result of this, two corvettes and two Agosta-class submarines that had been ordered for the Navy were not delivered. Instead, South Africa covertly ordered the Strike craft from Israel, three being built in Israel and six in South Africa. In 1977 the then Chief of the South African Defence Force changed the Navy's focus to that of a coastal navy and as the Border War began to escalate, the Navy's budget was cut dramatically. The Border conflict ended in April 1989 and was followed by cutbacks in all arms of the South African Defence Force and the Navy had to retrench approximately 23% of its personnel, the South African Marines were disbanded and the two Naval Commands (Naval Command East and Naval Command West) were closed, as were the Naval Bases Cape Town and Walvis Bay. After the first democratic elections in South Africa, the South African Navy once again started showing the flag around the world and began participating in exercises with other navies. In 1997 the South African Navy celebrated 75 years with 15 countries sending ships for the festivities. 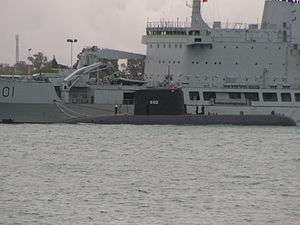 The need to re-equip the Navy was addressed by what is known as the Arms Deal and the Navy acquired four frigates (the South African Air Force also acquired helicopters for the frigates) as well as three submarines. The Maritime Rescue Coordination Centre (MRCC) was located in a bunker at Silvermine. In 2004 this function passed from the Department of Defence to the South African Maritime Safety Authority (SAMSA), an agency of the Department of Transport (South Africa). The MRCC is located within the SAMSA Centre for Sea Watch and Response. A budget of roughly R2.55 billion ($303 million at 2012 exchange rates) was allocated for the Navy for the 2012–2013 fiscal year. Despite an updated fleet, AllAfrica reported in December 2010 that the navy's capabilities are limited and it would have difficulty contributing to anti-piracy efforts off Somalia. AllAfrica reported in January 2011 that with the navy's current budget it would only be able to put one frigate and support ship to sea at any given time. It was thought that such a deployment would deplete the 2011 annual operational budget. The Navy conducts several naval warfare and patrol exercises per year despite its budget problems such as Exercise Red Lion. It regularly participates in exercises with other national navies such as the United States Navy (Exercise Shared Accord/Southern Accord), NATO naval battlegroups (Exercise Amazolo), German Navy (the biennial Exercise Good Hope), Royal Navy (several ad hoc exercises when ships visit South African waters), Indian Navy (the biennial Exercise Ibsamar), National Navy of Uruguay and the Brazilian Navy (Exercises Atlasur and Ibsamar). At least one or two Valour-class frigates and one Heroine-class submarine takes part in these multinational exercises, usually along with aircraft support from the South African Air Force. 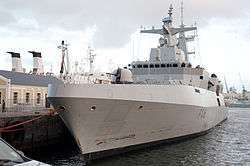 The Navy has also provided security for the 2010 FIFA World Cup by deploying three frigates to the coastal waters off the cities of Durban, Port Elizabeth and Cape Town. The Frigates' sophisticated air and sea surveillance radars allowed them to provide security for the events taking place along the coast. In recent years several decommissioned Warrior-class strikecraft were refurbished by Simons Town Dockyard and recommissioned as offshore patrol vessels (OPVs). 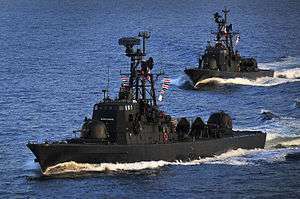 Their aged Skerpioen missile launchers were removed, providing extra room for a small RHIB boat and a small contingent of seaborne commandos to board suspect vessels. Reclassed as OPVs, these vessels are armed with one or two OTO Melara 76 mm naval artillery gun as well as a pair of 20 mm guns and a pair of 12.7 mm heavy machine guns. Three of the former strikecraft were refurbished and are commissioned as SAS Isaac Dyobha, SAS Galeshewe and SAS Makhanda. A fourth vessel, SAS Adam Kok, is being considered for refurbishment. However, as of August 2014 it appears unlikely that this fourth vessel will be converted, though its fate remains undetermined. The South African Navy Director Force Preparation has also said that they hope to use these craft as training vessels for the naval training base SAS Saldanha. A further four ex-Mine Hunter vessels are also being operated in the OPV role. These include SAS Umkomaas, SAS Umhloti, SAS Umzimkulu and SAS Umgeni. Rear Admiral Hanno Teuteberg, Chief Director Maritime Strategy, said in 2013 that the early Indications are that the life of the OPV vessels can be extended for at least five or more years, to coincide with Project Biro, the new build Offshore/Inshore patrol vessel project. The Navy currently has a warship deployed in the Mozambique Channel to support the anti-piracy initiative, Operation Copper, which aims to dissuade pirates from operating in Southern African waters. The Operation has been running since 2011 after several ships were attacked by pirates in the area. All of the Navy’s Valour-class frigates have been deployed in the region on rotation since the operation first began. The refurbished Warrior-class OPVs have also been deployed several times. 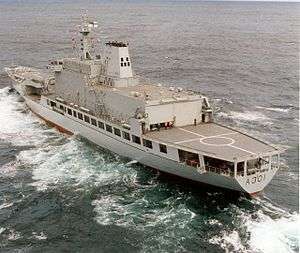 The Navy’s single replenishment vessel SAS Drakensberg (A301) has also spent time on station. The vessels are supported by a C-47TP maritime patrol aircraft and rotary-winged aircraft including Super Lynx and Oryx helicopters from the South African Air Force. In addition to ship’s crews the Navy has also deployed elements of its Maritime Reaction Squadron (MRS) aboard vessels in the Mozambique Channel. Naval Base Durban, previously downgraded to a naval station in 2002, is being upgraded to a fully-fledged naval base to house the newly refurbished Warrior-class Offshore Patrol Vessels, as well as those to be procured through Project Biro in the future. Rear Admiral Mosuwa Hlongwane commented that "The re-establishment of the naval base on Salisbury Island is on track and the OPVs will be stationed in Durban. As this facility is in the heart of South Africa’s busiest harbour, a balance has to be found between commercial and defence requirements in the ever-growing Durban port". This also gives the South African Navy an operating base from which it can more effectively conduct missions along the South African Eastern coast and in the Indian Ocean. In December 2015 the facility was redesignated a naval base. The South Africa Marine Corps was set up as a sub-branch of the Navy in 1979,:339 with the primary purpose of protecting harbours. Marines were also deployed at Katima Mulilo in South West Africa during the South African Border War, where they were responsible for patrolling the Zambezi River. The Marines also acted as regular infantry at the Border until 1988 as well as performing counter-insurgency operations inside South Africa. During township duties in the mid-1980s the detachment used facilities at SAS Rand in Johannesburg and on Signal Hill outside of Heidelberg. The Marines had an amphibious landing capability by operating from Tafelberg and Drakensberg. An elite company, named the Marine Amphibious Company (MAC), was formed to ensure the beach-head capability for landing large task forces. The Marines trained and fielded a small elite reconnaissance detachment between 1983 and 1989, under the direct control of the Marine CO, they received airborne, diver and urban counter measures training from other army units within the SADF. The Marines were disbanded on 18 January 1990, following a major restructuring of the Navy at the end of the South African Border War. An Maritime Reaction Squadron was established in 2005, which is effectively a marine corps. The command structure is depicted below. The Chief of the Navy, based at Navy Headquarters at the Navy Office (SAS Immortelle) located in Pretoria, heads up the South African Navy. All operational forces, including ships and submarines, fall under the control of the Flag Officer Fleet who is based in Simon's Town. Fleet Command includes all vessels and units of the Navy other than Naval Headquarters, Pretoria. 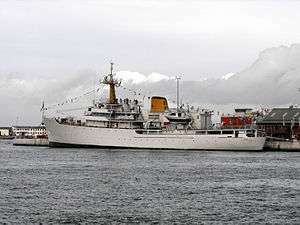 Fleet Command is based in Simon's Town under control of Flag Officer Fleet. Director Fleet Human Resources (DFHR) is responsible for all training and manning and also controls the training units. Director Fleet Logistics (DFL) is responsible for all Logistics units as well as for the maintenance of the fleet. Naval Base Simon's Town – the only full naval base currently in the SAN. All combat units have been concentrated here in an attempt to curb costs. The base also houses training facilities for the new frigates and submarines. A naval dockyard is also situated here, although it is in the process of being privatised. Naval Base Durban – Naval Base Durban, built during the Second World War, was scaled down to a naval station in 2002 with the rationalisation of the fleet. In April 2013 it was announced that the base would be re-opened and upgraded to assist with the piracy mission on Africa's East coast and to establish a permanent fleet presence on the East Coast. In December 2015 it was redesignated a naval base. Naval Station Port Elizabeth – provides support to the fleet. SAS Saldanha – located on the West Coast and provides training and development for ratings. South African Naval College, Gordon's Bay – training college for naval officers. As at 1 September 2011 there are approximately 6104 active uniformed members augmented by 1313 civilians and 1000 reserve members. The seven old Navy Reserve units were closed down during 2006. They were modeled on the Royal Naval Reserve unit system. A new Navy Reserve system was created consisting of roughly 1000 reserve posts. These posts are pooled and members drawn from them as needed to augment full-time units and ships' companies. From 1922 to the 1950s the SA Navy was effectively part of the Royal Navy and wore the same uniforms and similar insignia. In 1959 the Crown in the SAN cap badge was replaced with the Lion of Nassau from the crest of the country's coat of arms. A black beret replaced the peaked cap in working uniforms. In 2000 the new Coat of Arms was unveiled and the Chief of the Navy tasked Fleet Command to look at revising the Navy uniforms to reflect the new coat of arms. This saw new rank insignia for non commissioned officers being implemented as well as the introduction of a side cap. The rank system is based on that of the (British) Royal Navy. The warrant officer ranks were expanded in 2008, with ranks that had been substantive based on the post now becoming a rank that the person maintained. There is a planned programme to equip the frigates with UAVs to supplement the helicopters. Previously before its retirement the SAAF operated the Westland Wasp for the SAN in the anti-submarine warfare role. The Maritime Reaction Squadron provides an amphibious, diving and small boat capability to the Navy, deploying infantry-trained South African Navy personnel in various peacekeeping roles within the African continent and to assist in boarding operations at sea, humanitarian operations and disaster relief. The Maritime Reaction Squadron was formed as the Naval Rapid Deployment Force (NRDF) in 2005. Operational Diving Division (ODD) consisting of four operational diving teams of 17 divers. Simonstown Agreement (1955–1975) between the UK and South Africa. ↑ Helfrich, Kim. "SANDF not meeting staffing targets - defenceWeb". defenceweb.co.za. Retrieved 6 November 2016. 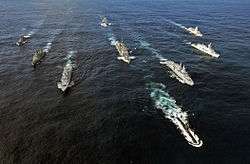 ↑ "Navy top brass don't have to go to sea". Flyafrica.info. Retrieved 2012-07-12. ↑ "Role of the SA Navy – Page 3". Navy.mil.za. Retrieved 2012-07-12. ↑ Wessels, André (2009). "The South African Navy and its Predecessors, 1910–2010: A Century of Interaction with Commonwealth Navies" (PDF). Department of History, University of the Free State. Retrieved 2012-08-03. 1 2 "5 – National Security". South Africa: a country study (PDF). Federal Research Division, Library of Congress. 1997. ISBN 0-8444-0796-8. ↑ "NAVY, South African". Standard Encyclopaedia of Southern Africa. 8. Nasou Limited. 1971. pp. 113–5. ISBN 978-0-625-00324-2. ↑ Wessels, Andre (December 1994). "The first two years of war: the development of the Union Defence Forces". Journal for Contemporary History. 19 (3). ↑ "History of the SA Navy". Navy.mil.za. Retrieved 2012-07-12. ↑ Union of South Africa Government Gazette 4698 (28 September 1951) : Proclamation 209 of 1951. ↑ "South African Navy - Unlikely Ambassadors". navy.mil.za. Retrieved 6 November 2016. ↑ Du Toit, Allan (1992). South Africa's fighting ships past and present. Ashanti Publishing. pp. 193–200. ISBN 978-1874800507. ↑ Wessels, Andre (November 2005). "The South African Navy's frigates, 1944–1985". Naval Digest. 11: 1–36. ↑ Du Toit, Allan (1992). South Africa's fighting ships past and present. Ashanti Publishing. pp. 281–289. ISBN 978-1874800507. ↑ Du Toit, Allan (1992). South Africa's fighting ships past and present. Ashanti Publishing. p. 303. ISBN 978-1874800507. ↑ Bennett, C. H. & Söderlund, A. G. (2008). South Africa's Navy : A Navy of the People and for the People. p. 35. ISBN 978-0-620-41446-3. ↑ Bennett, C. H. & Söderlund, A. G. (2008). South Africa's Navy : A Navy of the People and for the People. p. 37. ISBN 978-0-620-41446-3. ↑ Bennett, Christopher Hart (2011). South African naval events : day-by-day, 1488 to 2009. Naval Heritage Trust, 2011. p. 9780620430142. ↑ "South African Navy - Unlikely Ambassadors". Navy.mil.za. Retrieved 2012-08-03. ↑ "The SA Navy and an African Renaissance - Occasional Paper No 27 - November 1997". Iss.org.za. Retrieved 2012-08-03. ↑ "SA navy to have all new corvettes and submarines by 2007". Engineeringnews.co.za. Retrieved 2012-08-03. ↑ "South African Navy (SAN)". Globalsecurity.org. ↑ "Sea Watch & Response". SAMSA. Retrieved 2012-07-12. ↑ "Vote 22 Defence and Military Veterans - National Treasury estimates of national expenditure" (PDF). 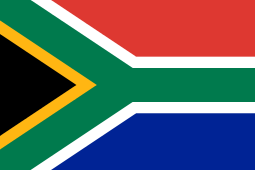 National Treasury Department: Republic of South Africa. 22 February 2012. Retrieved 2012-08-03. 1 2 "allAfrica.com: South Africa: Navy's Frigates and the Somali Pirates". 14 December 2010. Retrieved 2010-12-15. ↑ Wingrin, Dean. "Royal Navy in exercise with SA sub". defenceweb.co.za. DefenceWeb. Retrieved 26 November 2014. ↑ Wingrin, Dean (6 September 2012). "South African Navy readies for exercise Atlasur IX". defenceweb.co.za. DefenceWeb. Retrieved 26 November 2014. ↑ Helfrich, Kim (7 March 2014). "Exercise Ibsamar set for October". defenceweb.co.za. DefenceWeb. Retrieved 26 November 2014. ↑ "New captains for three SA frigates". defenceweb.co.za. DefenceWeb. 30 June 2011. Retrieved 26 November 2014. ↑ "Revamped strike craft ready for counter-piracy duty". defenceweb.co.za. defenceweb.co.za. Retrieved 21 August 2014. ↑ Helfrich, Kim (20 August 2014). "South African shipbuilding now a strategic industry". Defenceweb.co.za. Retrieved 21 August 2014. ↑ Wingrin, Dean. "Navy commences upgrade of fourth strike craft". defenceweb.co.za. defenceweb.co.za. Retrieved 21 August 2014. ↑ Helfrich, Kim. "Operation Copper still up and running". DefenceWeb. DefenceWeb. Retrieved 21 August 2014. 1 2 Helfrich, Kim (2015-12-09). "Minister says it's Naval Base Durban, not Station". defenceWeb. Retrieved 2015-12-09. ↑ Pitta, Robert (1993). South African Special Forces. Osprey. ↑ Bennett, C. H. & Söderlund, A. G. (2008). South Africa's Navy : A Navy of the People and for the People. p. 59. ISBN 978-0-620-41446-3. ↑ Mudimu, J. (18 May 2007). "Presentation on the Transformation of the SA Navy" (PDF). Retrieved 2012-08-03. 1 2 3 4 5 6 7 8 9 10 11 12 13 14 15 16 17 18 19 "Organigram of the SA Navy" (PDF). navy.mil.za. Navy, RSA Department of Defence. Retrieved 26 November 2014. 1 2 Helfrich, Kim. "Hlongwane named new Navy Chief". Defenceweb. Retrieved January 23, 2014. ↑ Wingrin, Dean (31 January 2014). "Navy bids farewell to Admiral Schoultz". DefenceWeb. Retrieved 3 February 2014. ↑ "Promotions and transfers: Brigadier General/Rear Admiral (Junior Grade)". DefenceWeb. 2010-11-04. Retrieved 2012-07-23. ↑ Bennett, C. H. & Söderlund, A. G. (2008). South Africa's Navy : A Navy of the People and for the People. p. 69. ISBN 978-0-620-41446-3. ↑ Bennett, C. H. & Söderlund, A. G. (2008). South Africa's Navy : A Navy of the People and for the People. p. 70. ISBN 978-0-620-41446-3. ↑ Bennett, C. H. & Söderlund, A. G. (2008). South Africa's Navy : A Navy of the People and for the People. p. 149. ISBN 978-0-620-41446-3. ↑ Mkamba, Lungelo; Coetzee, Cobus; Sapa (5 April 2013). "Navy to return to Durban's Salisbury Island". Retrieved 2013-04-29. ↑ "SAS Saldanha Home Page". Navy.mil.za. Retrieved 2012-08-03. ↑ Bennett, C. H. & Söderlund, A. G. (2008). South Africa's Navy : A Navy of the People and for the People. p. 153. ISBN 978-0-620-41446-3. ↑ Bennett, C. H. & Söderlund, A. G. (2008). South Africa's Navy : A Navy of the People and for the People. p. 157. ISBN 978-0-620-41446-3. 1 2 "Presentation by Chief of the SA Navy on the transformation of the SA Navy to the Joint Standing Committee on Defence (SJCD)" (PDF). Retrieved 2012-08-03. ↑ Bennett, C. H. & Söderlund, A. G. (2008). South Africa's Navy : A Navy of the People and for the People. p. 187. ISBN 978-0-620-41446-3. ↑ Bennett, C. H. & Söderlund, A. G. (2008). South Africa's Navy : A Navy of the People and for the People. p. 179. ISBN 978-0-620-41446-3. ↑ "Vision & Mission". Navy.mil.za. Retrieved 2012-08-03. ↑ Pale, Lt Col Frans. "Minister approves new ranks for Warrant Officers" (PDF). Retrieved 2012-08-03. ↑ "Valour-class Frigates". Navy.mil.za. Retrieved 2012-08-03. ↑ "Submarines". Navy.mil.za. Retrieved 2012-08-03. 1 2 Campbell, Keith (4 October 2013). "South African Navy mulls future requirements as fleet remains active". engineeringnews.co.za. Engineering News. Retrieved 26 November 2014. 1 2 McVeigh, Steve (25 June 2013). "SA Navy in process of refurbishing". www.bairdmaritime.com. Retrieved 26 November 2014. 1 2 3 "Patrol Forces". Navy.mil.za. Retrieved 2012-08-03. ↑ "Mine Warfare Forces". Navy.mil.za. Retrieved 2012-08-03. 1 2 "Auxiliary Equipment". Navy.mil.za. Retrieved 2012-08-03. ↑ "Tugs". Navy.mil.za. Retrieved 2012-08-03. ↑ "SA Navy to commission Maritime Reaction Squadron". defenceweb. Retrieved 2014-07-19. 1 2 "Maritime Aircraft". South African Navy. Retrieved 24 July 2014. ↑ Engelbrecht, Leon. "Fact file: Valour-class frigates - defenceWeb". defenceweb.co.za. Retrieved 6 November 2016. ↑ "FRIGATES". navy.mil.za. navy.mil.za. Retrieved 24 July 2014. 1 2 "Maritime Protection Squadron". Navy.mil.za. 2011-02-02. Retrieved 2012-07-23. ↑ Engelbrecht, Leon (21 November 2005). "Navy setting up rapid deployment force for peacekeeping". DefenceWeb. Retrieved 21 July 2014. ↑ "SA Navy to commission Maritime Reaction Squadron". DefenceWeb. 2008-12-08. Retrieved 2012-07-23. Wikimedia Commons has media related to Navy of South Africa.